After attending the webcomics panel at WorldCon last summer, I ended up with a great list of recommended comics to read online. The description for Gunnerkrigg Court was intriguing, so I decided to try that one first. And what a great choice for my first webcomic experience! The story opens with Antimony (Annie) Carver showing up as a new student at a private boarding school called Gunnerkrigg Court. The school is a fascinating and mysterious place, as it contains supernatural and mythological beings as well as advanced technology, such as strange machines and robots. There appears to be some sort of tension between the Court and the nearby forest, Gillitie Wood, where students are not permitted to roam and technology is expressly forbidden. Little by little the reader learns of Annie's unusual past, and the more the reader learns, the more questions are raised. Annie's own parents attended the school when they were young, as did the parents of Annie's new best friend, Kat. Events from their parents' time together appear to be linked to current events that involve Annie, Kat and their classmates, an odd assortment of children with unusual abilities. I am enjoying this comic immensely. The story is a delightful mix of mystery, adventure, suspense and humor, and it is so quirky and creative that I am constantly - happily - surprised. Annie is a strong protagonist, but she does have her weaknesses, and Kat is a great sidekick. She's a total science geek, a technological whiz kid, and her abilities are a great complement to Annie's skills in dealing with supernatural phenomena. They make a great team. The artwork is arresting and expressive, and the backgrounds are evocative and atmospheric. I love that the characters are very easy to distinguish from each other - with some graphic novels the characters have a sort of generic look that makes it difficult to tell them apart. For a long time this comic was only available online, but now it has been published in a print version. So far there Gunnerkrigg Court: Orientation, which collects the first fourteen chapters, and Gunnerkrigg Court: Research, which is forthcoming. This story is appealing to adults, but I'd also recommend it to teens and interested younger children as well. It's complex, and readers must pay attention in order to catch hints and clues, but it is a family-friendly story, full of humor and excitement. I plan to buy the first volume for my older daughter's eleventh birthday. I know she'll love it as much as I do. 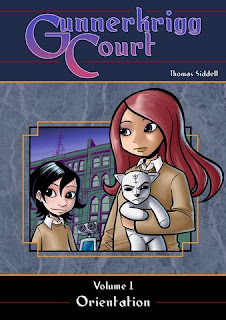 Paradoxical Reading, Writing and Randomness: "It’s a bit hard to explain Gunnerkrigg Court, but that’s part of the mystery. 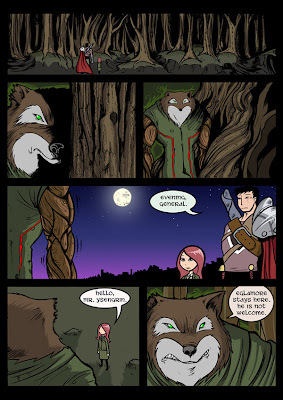 If you read any sf/fantasy webcomic, read this one." Ooo! This is so exciting! Finally something I can check out and not have to pay for or look hard for from your blog. hahah! I really like the art you posted so I am going to go linger around the webcomic for a while now. Thank you! I've been a reader of Girl Genius for quite a while now and I love it. This sounds really, really fun though so I'll have to see about trying it. I used to read webcomics all the top, but it has been a few years. This one does look good should I ever get back into reading them! I absolutely love boarding school stories. I have a hard time reading long-form webcomics, though, so I'm hoping my library will have this. It sounds great! Hey thanks for the review on Need by Carrie Jones, its on my list of must-reads. I just finished Hush, Hush by Becca Fitzparick or Fitzwilliams, something like that. It was ok, no Twilight but at least the girl character wasn't as annoying as Bella! I'm enjoying this resurgence of teen vampire lit. I remember when all there was out there was Vampire Diaries (yes that is right, I read them before this all became popular!). Ladytink - Girl Genius is my current webcomic of choice - it's great so far. I hope you'll give this one a try - it's so much fun. Kailana - I think you'd really enjoy this! Jenny - I hope your library has it. Mine doesn't, but I will put in a suggestion because graphic novels are so popular with kids and often turn them into passionate readers. VA Gal - Can't wait to hear what you think of Need. I read Vampire Diaries years ago, too. I guess it holds up well and doesn't seem dated, because it flies off the shelves at my library. Darla, oh my god. I just read the first volume and I had to tell you. I am IN LOVE. I saw it in a graphics catalogue and recommended it for purchase, and the minute it came I brought it home. SO GOOD. I have just ordered copies for myself. Thank you so, so much for the recommendation!